JANUARY 2019 THE SHOP 17 W hat do you have in common with the chairman and CEO of Camping World and Good Sam Enterprises, Marcus Lemonis, and how can what he's done and continues to do impact your shop and your business? Kampgrounds Of America's (KOA) 2018 North American Camping Report, authored by Scott Bahr of Cairn Con- sulting Group, reported that in the U.S., there are an estimated 77 million camping households, and since last year, the number has increased by about 2.6 million new households. This progression has grown by more than 6 million since 2014, and outdoor recreation appears to be headed for more growth in the years to come. According to the report, the number of households that camp at least once a year increased by 20 percent between 2014 and 2017. During that same time, households that camp three or more times a year grew by 64 percent. What this means to KOA is that not only are more people camping, but they are also camping more frequently. 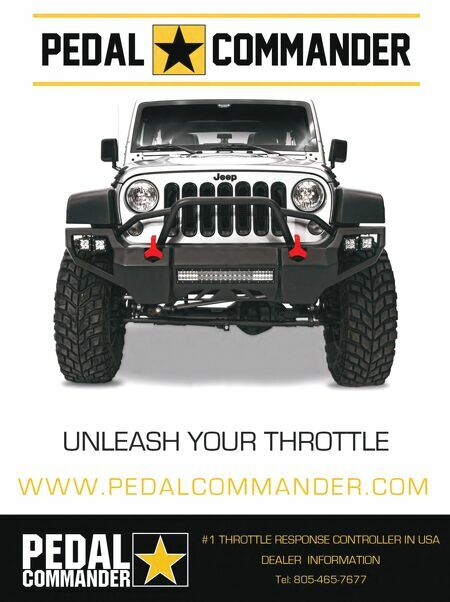 To shops, this should be a wake-up call if you're not already catering to campers, or you're not reaching out to campers who are new to off-roading or adventure travel. ESCAPE THE ROUTINE Among new campers, 40 percent intended to camp more in 2018 than they did in 2017, and 88 percent of all campers intended to camp more in 2018, the report noted. The ethnic makeup of campers is shifting as well, with nearly half of all new campers in 2017 being non-white. Camping is viewed as an escape from the routine, with 40 percent of respondents saying camping is a time to relax without feeling as though they have to be some- where or do something. Escaping stress, clearing their minds and spending time with friends and family are among the top reasons why people camp. Here are some others: • 62 percent of campers feel it is an afford- able vacation option. The cost of other types of travel impacted their decisions to camp, with 40 percent responding that it played a part in deciding what to do for vacation. Distance from home is another consideration, with 35 percent of all campers saying they camp within 50 miles of their home, up from 26 percent in 2016 and 17 percent in 2015. Among new campers, 46 percent stay within 50 miles of home. • 87 percent of millennials (born 1981- '87) want some form of physical out- door recreation while camping, while 82 percent of Gen Xers (1965-'79) and 69 percent of baby boomers (1946-'64) feel likewise. As you might expect, the growing impact of millennials can be found throughout the report. Not only are more households camping, but they are bringing others with them to GET OUT! 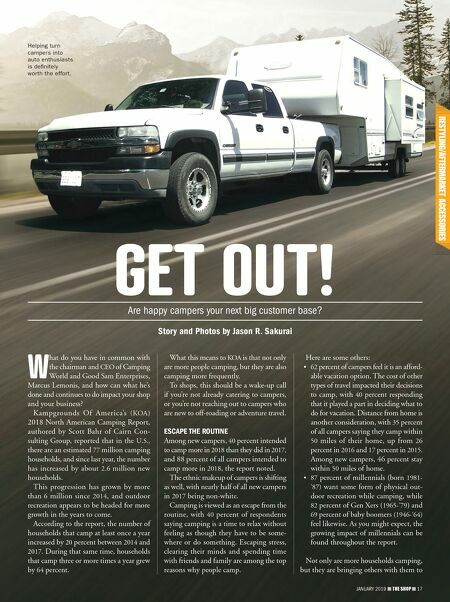 Are happy campers your next big customer base? Story and Photos by Jason R. Sakurai JANUARY 2019 THE SHOP 17 Helping turn campers into auto enthusiasts is definitely worth the effort.